Turmeric three ways: The fresh rhizome (upper right), the boiled and dried rhizome (upper left), and ground to a powder (center). The dried rhizome is normally hard as a rock and must be pulverized in a commercial grinder. Recently, I tagged along to a friend’s medical appointment. The cardiologist, young and smartly dressed, eyed the darkly mysterious cover of a book I had in my hand. “What’s that,” he asked, eyebrows raised. “It’s a cookbook,” I replied. “Oh, I thought it was something my wife might be reading,” he shot back sardonically. We all laughed: The title of the book, clearly visible, was Bitter—and no, it’s not the inside scoop on unhappy marriages. 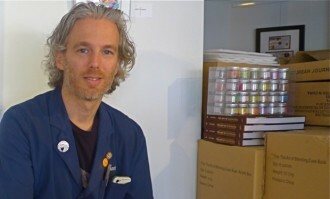 It’s a cookbook that explores the many permutations of the taste of bitterness, or as writer Jennifer McLagan notes, “the world’s most dangerous flavor,” as found in foods such as grapefruit, coffee and turnips. 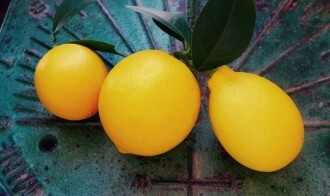 Unlike easy-to-love sweetness, brightly sour citrus flavors or addictive saltiness, it’s fair to say that most of us have an uneasy relationship with bitter. Too much and danger signals start to sound in the most primitive part of our brains. A bitter taste might mean that the food in question is poisonous—or poisonously unripe. As McLagan observes, “our natural defense system” springs into action and may cause us “to grimace and often to spit…out” even slightly bitter-tasting foods. Yet the converse is also true. Bitterness can be alluring, especially when it keeps sweet tastes from becoming cloying. The recent obsession with cocktail bitters alone proves the point—our favorite old-fashioned recipe, sweetened with Luxardo syrup, also adds not one but four kinds of bitters to the glass. On restaurant menus ingredients such as turnips and brussels sprouts have become almost ubiquitous, along with greens such as kale and arugula. After my own quick tasting session, I was fascinated to see how the dominant taste of many spices is heightened by a touch of bitterness. Black peppercorns, for instance, can be fiery, but the heat often comes with bitter aftershocks. Spanish paprika is bittersweet; smoking adds an acrid dimension to its flavor. Cinnamon, usually described as a sweet spice, has an astringent, distinctly bitter edge. Earthy cumin, lemony coriander, sweet fennel seed—all these aromatic spices are chased with bitterness. The interesting thing is that once they are combined with other ingredients—say, in a curry—they don’t actually taste bitter. Instead, they add depth and complexity to whatever is in the pot, and may even stoke our hunger. Of all the bitter-inflected spices, turmeric is, in a curious way, the most appealing. The fresh orange-brown rhizome, which you can find in Asian markets as well as some grocery stores, has a bright almost carrot-y aroma; its flavor is mildly pungent–a lot like very mellow ginger root with a mildly bitter kick. 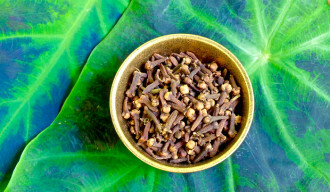 When the rhizome is boiled, dried and ground, the spice acquires a distinctively dry, earthy flavor that is both peppery and ever so slightly bitter. 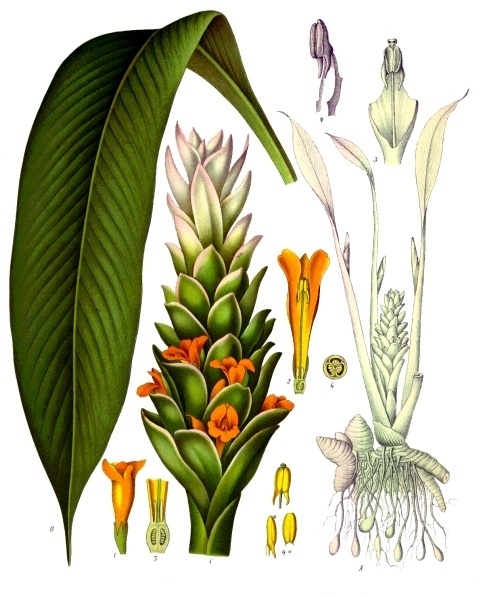 Botanical drawing of curcuma longa by Franz Eugene Kohler in Medizinal Pflanzen, 1897. Image source: public domain via Wikimedia Commons. Botanically speaking, turmeric is a tropical plant in the Zingiberaceae family, a vast community of over 1,300 species of “aromatic perennial herbs with creeping horizontal or tuberous rhizomes,” including spices such as ginger and cardamom. Turmeric itself falls into the Curcuma genus, a subcategory of plants whose most important chemical constituents are a group of compounds known as curcuminoids which are believed to have potent anti-oxidant and anti-inflammatory properties. The word curcuma, incidentally, comes from the Arabic kurkum, which is said to be used for both turmeric and the entirely unrelated spice saffron. The word “turmeric” is thought to have originated in the Latin terra merita, or “meritorious earth,” a phrase which alludes to its naturally golden color. 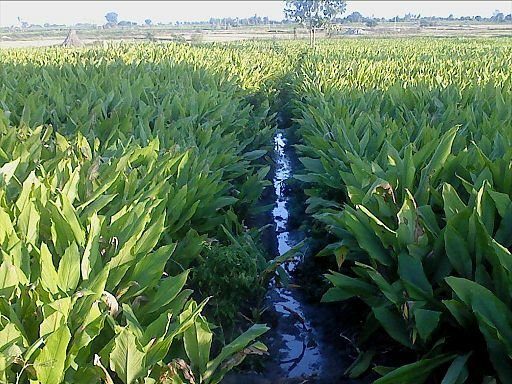 Turmeric growing in Kothapally, India. Photo source: Rajkumar182, 2010, Wikimedia Commons. I first saw turmeric growing in a small spice garden in Kerala where at a Hindu family’s private temple, bowls of milk mixed with turmeric were set out for the sacred nagas, or serpents, who came to slake their thirst after nightfall. While the pointy leaves are sometimes used in cooking, it is the underground, finger-shaped rhizome that yields the familiar spice. 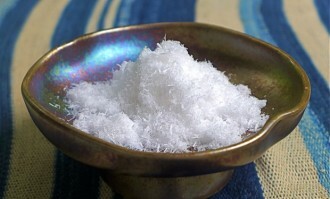 It can be used raw, but more often is boiled and dried, then ground to a powder. In the family’s open air kitchen, I helped to prepare a banana leaf feast which included widely eaten vegetarian dishes such as a sambar or curry, made with indigenous vegetables such as lady fingers, drumsticks and elephant yam, and kaalan, a mildly sweet and spicy fruit curry with plantains, green chilies and coconut. Both dishes included one-quarter teaspoon of turmeric, a light, almost medicinal dose, perhaps as much for health as for color or flavor. One of the most delectable dishes in Ramachandran’s book is Maampaza Kaalan, or Ripe Mangoes in Coconut Yogurt Sauce. This delicacy, made during mango season, achieves its golden color mostly from the ripe fruit but also from the half teaspoon of turmeric which is sprinkled over the cut up mangos before they are simmered in water for a few minutes. To this is added a puree of fresh ground coconut, green chilies and black pepper, and after further simmering, yogurt which has been beaten into “a thick, smooth liquid.” It is finished with a sprinkling of jaggery or brown sugar and topped with a tarka of mustard seeds, dried red chili, fenugreek seeds and curry leaves spluttered in oil. Though the two spices are entirely unrelated, turmeric was once known as “Indian saffron” because of its golden hue. For thousands of years, the rhizome has been used as a dye for the robes of Buddhist monks. Because Gautama Buddha was said to have chosen yellow—a hue once worn by criminals—for his own robes, the color has come to symbolize humility, selflessness and renunciation of the material world. Yellow is also considered the color of earth and thus signifies “the rootedness and equanimity of earth.” All these mystical properties devolve upon turmeric because it is the source of the sacred color. 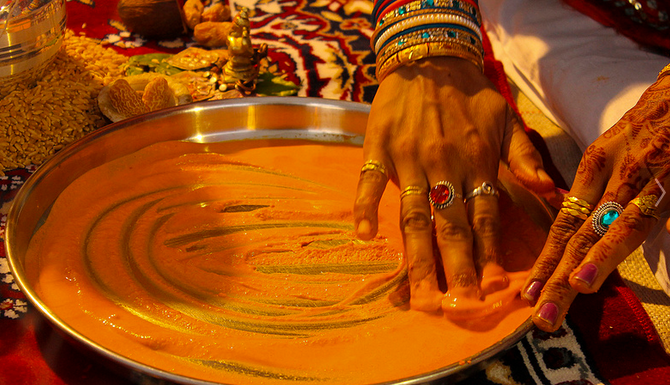 Even in today’s high tech world, turmeric continues to play a role in traditional Indian religious ceremonies. In some Indian states—Bengal, Punjab, Maharashtra and Gujarat—a wedding is preceded by a haldi ceremony in which friends rub turmeric paste onto the bodies of the bride and groom, cleansing body and soul, leaving behind a distinctly golden glow. In western and coastal India, turmeric rhizomes are tied to the wrists of the couple during a ceremony known as Kankanabandhana. Nor is turmeric’s auspicious reputation limited to India. 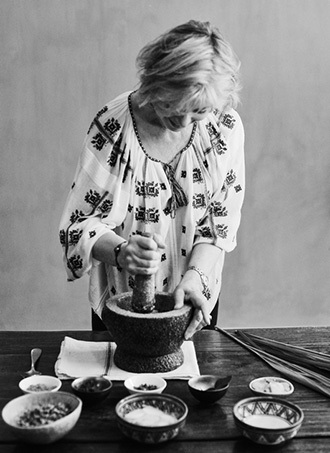 In Bali, for example, rice may be cooked with turmeric to give it a golden hue, shaped into a cone and taken as an offering to one of the island’s many Hindu temples. In Thailand it is believed to possess magic powers. Kasma Loha-Unchit, author of It Rains Fishes, writes, “…a piece of the wild rhizome ingested or worn is said to strengthen one’s constitution when magic words are chanted to invoke its protective essence.” Loha-Unchit’s cookbook, incidentally, has a heavenly recipe for wok-fried catfish that has been marinated in chopped raw turmeric. On her website, you can find a recipe for Tom Kem Kati Pla Doog, in which pieces of catfish are simmered in a coconut sauce flavored with raw turmeric. 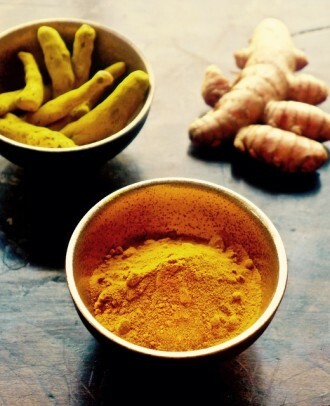 This brings us to turmeric’s health-giving properties. In traditional Chinese and Indian medicine, turmeric has long been valued for its antiseptic, anti-oxidant and anti-inflammatory properties. It has been used to heal everything from cuts, bruises and burns to indigestion, dysentery and colic. (As author Monica Bhide notes in ”Turmeric: the Healing Spice,” at Spirituality & Health, the Sanskrit word for turmeric translates as “germicide.”) In Ayurvedic medicine, it is considered a warming spice that acts upon the spleen and the liver. Our local Indian spice merchant advises drinking a cup of warm milk laced with turmeric to get rid of the mucus and congestion of the common cold. Here at Spicelines, we are big fans of turmeric, not only for cooking—we use a pinch or two almost every day—but also for its curative powers. We regularly use ballpark mustard to heal kitchen burns. The secret ingredient? Turmeric, which gives the mustard its bright yellow color. If anyone happens to touch a hot cast iron pan or heated element in the oven, we slather on some French’s mustard—no, Dijon is not made with turmeric—and find that within a few hours, the burn has disappeared. The skin never blisters. In recent years, turmeric has been the subject of numerous scientific studies focusing on curcumin, and the effect it seems to have on a staggering number of ailments. In the CRC Handbook of Medicinal Spices, herbalist James Duke lists a host of serious illnesses in which turmeric may have some application; these include everything from malaria to rheumatoid arthritis, certain types of cancer and HIV. It is important to note that most results are considered inconclusive. Still, as Duke observes, in addition to their other perceived benefits, turmeric and other “naturals” likely have fewer side effects than manufactured pharmaceuticals. Turmeric tea is an easy way to enjoy turmeric’s health-promoting curcuminoids. This version, found at Quitokeeto, includes dried ginger, rosemary, citrus peel and black pepper as well as turmeric. In the meantime, early spring, when our bodies are adjusting to a new season, is an ideal time to enjoy a cup of health-boosting turmeric tea. A delicious one can be found on Heidi Swanson’s kitchen website, Quitokeeto. 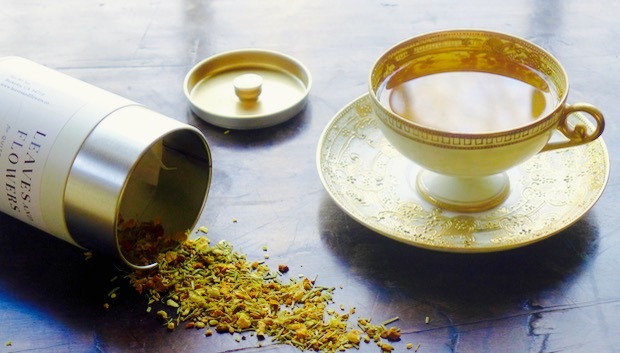 Made by Leaves and Flowers, a small Berkeley purveyor, this aromatic Turmeric Wellness Tea blends the dried pulverized rhizome with a carefully considered selection of other spices and herbs including dried ginger, rosemary, orange and lemon peel, and black pepper. Each brings different virtues to the party, but what I really love is the overall fragrance: It is fresh and penetrating, almost as if the ingredients were gathered right after a thunder storm when the atmosphere is crackling with electricity. Steep for four minutes as instructed and the brew is delicate, slightly sweet, gently pungent, with just a hint of bitterness. Double the steeping time and the tea turns a deep gold and its pungency increases exponentially. This is the way I like it the best. The black pepper, by the way, not only gives the tea a little heat, but its principle compound, piperine, dramatically increases the absorption of turmeric’s curcuminoids. Although in the west, turmeric is widely associated with Indian food and, in particular, with commercial curry powders where, sadly, it is often used to excess, the spice also turns up in other culinary traditions. One of the most interesting is the cooking of Persia, in which turmeric is commonly used in khoreshes, or stews. Years ago, my mother gave me The Art of Persian Cooking, a charming volume written by Dr. Forough Hekmat, a scholar with a doctorate in Persian literature from the University of Teheran. Hekmat, who left Iran in the 1950’s, was part of the old aristocracy and her book is replete with dreamy evocations of family parties and holiday feasts at which exquisite foods were served. She has an entire chapter on khoreshes, many of which begin with the sauteeing of lamb or veal with onions and turmeric. A favorite “easy” khoreshe from the Rashti region where fine long grain rice is cultivated is made with chunks of lamb sautéed with turmeric and onions, then simmered with lots of green herbs such as onion tops, cilantro and celery leaves. The dish is finished with a touch of water in which saffron has been dissolved and served over chelou, feathery buttered rice baked in the oven to form a crunchy crust in the bottom of the pan. For many centuries the Iranians have looked upon food from three different points of view—the medicinal, the philosophical, and the cultural. Their physicians and philosophers considered food and drink as the principal factors in reviving the body and as an effective means to strengthen or weaken man’s character. Consuming an excess of rich and luxurious foods, such as enormous quantities of red meats, fats, starch or alcoholic beverages, was considered to provoke evil thoughts and to convert a man into a greedy, selfish beast. A healthful diet of vegetables, fruits, fish, fowl and certain delicacies composed of mixed petals and blossoms of roses was believed to have unusual powers that could transform man into a gentle and noble creature. If you would develop both the body and soul. In other words, moderation in all things—and a pinch of turmeric for good measure! What a wonderfully comprehensive post on this spice. Turmeric’s fame for its health-giving properties has been pervasive in the news lately as a cure or treatment for all manner of ailments, but its culinary uses have been overlooked it seems. I enjoyed reading about it here in the variety of dishes you described. The mango dish sounded especially appealing. I’ll be trying the Turmeric Wellness Tea; I’ve enjoyed other turmeric-ginger blends and like their somewhat stark earthiness, but that one sounds more well-rounded and balanced. The ritual uses sound very interesting as well. What a way to start a marriage, all aglow! A very good, interesting and complete post about turmeric. I leasned quite a bit, especially about the aspect of the plant. I do not think that I have ever seen it, or if I have I didn’t know it was turmeric. I will keep my eyes open next time I travel in India!